Categories: Adult Adoptees, Children's Adoption Books, Open Adoption, Adoptee Memoirs, Adoption Gifts, Adoption Parenting, Adoption Search and Reunion, Adoptive Parents, Birthfather Books, Birthmother Books, Birthmother's Gifts, Birthparents, Books for Adoptees, Books for Birthparents, Child Care & Parenting, Growing Up Adopted, Open Adoption - Birthparents, About Adoption, Making the Decision. Honest, raw, powerful. 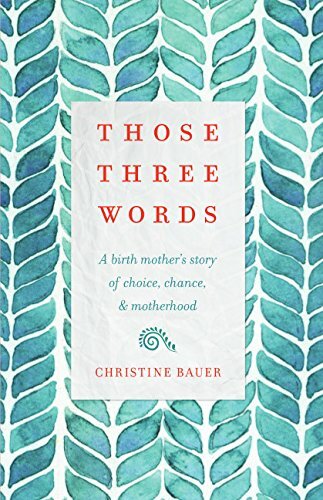 Christine Bauer’s memoir is a simultaneously heartbreaking and heartwarming page-turner about choice, adoption, motherhood, and family. You will laugh and cry right along with her. When Christine Bauer heard those three words ”you are pregnant” at the tender age of 18, she was devastated. She was not ready to be a mother, and she had an agonizing decision to make. Those Three Words takes readers along on Chris’ emotional journey about the power and importance of choice, the gift and anguish of adoption, and the deep bond of maternal love. It is a bittersweet book full of heartache and joy, and a powerful testament to love in all its forms.